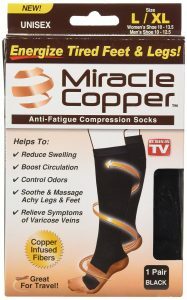 The ‘Miracle Copper Anti-fatigue Compression Sock’ (view on Amazon.com) is a unique piece of compression wear that features copper-infused fibers, designed to boost circulation and reduce swelling. I first came across this product when my Mum developed Plantar Fasciitis, a foot injury that causes a discomforting pain under the foot arch. Running is a very serious sport to my Mum, so obviously we wanted to put an end to the pain; this is where the Miracle Copper sock came in. The sock receives a lot of hype so I decided to get a pair for myself and see what all the fuss was about. Below is a detailed Miracle socks review, read down to see exactly what I thought of the product. Upon taking a closer look into the Miracle brand I found out that they only seem to do the one product. They are a brand that focuses solely on their copper compression socks. The brand is obviously very proud of their product and therefore spends much of their time and focus on making it the best in the industry. The brand is very well regarded in the compression market and used by many (this is seen in many of the Miracle socks reviews). There are actually a few characters trying to produce fake copies of the Miracle copper socks, they are that popular. The product has two main features that Miracle Copper has put all of their focus on. The socks are to be worn directly over your feet (not over standard socks) and underneath your chosen footwear. Graduated compression – This means that the compression of the sock is at its tightest around the foot and ankle; the compression of the sock reduces gradually as the sock travels up your leg. This is an important feature that will squeeze blood back to the heart. This increased blood flow means reduced swelling and improved circulation. Good stuff! CuTEC copper infusion – If you haven’t noticed by now, the copper in these compression socks is the main feature that separates this brand from the rest. The copper element is a wonderful product feature that reduces inflammation and leaves your feet feeling invigorated. It is claimed that copper is also anti-microbial and naturally helps eliminate odors, leaving your feet feeling fresh. Women’s sizes: Small/Medium (6-9.5), Large/XL (10-13.5). Please see the below video that will allow you to get a closer look at the Miracle copper sock. The video also goes into great detail on the product features and benefits. Take a look. This product has been specifically made for everyone that longs to enjoy increased comfort in their lower leg and feet. 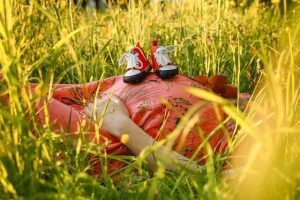 The product can actually be worn by anyone and is a well-regarded compression sock in multiple circles; sportsmen and pregnant woman alike. The compression sock comes with more than the one benefit; this means that there are a few situations in which I would recommend using it. Not partaking in extreme sports and feel that compression socks aren’t for you? This is not true at all, especially with this brand of sock. So you spend all day on your feet and you are experiencing aching pains. Or perhaps you spend the majority of your time in a fixed position where you aren’t getting proper blood flow to your feet. If so, then these socks are just for you. The copper element to these socks is a big improvement over the usual material socks that are all over the market. The copper gifts you with increased healing benefits and further reduces swelling. Socks can be found here on Amazon.com. The compression is rated at 8-15mmHG which is a relatively light compression sock; meaning it is ideal for everyday use. The sock ensures that the wearers’ muscles are fully warm and ensures that your ligaments are secure and less prone to injury. The socks are perfect for those of you that have any previous injuries, or even slight niggles. 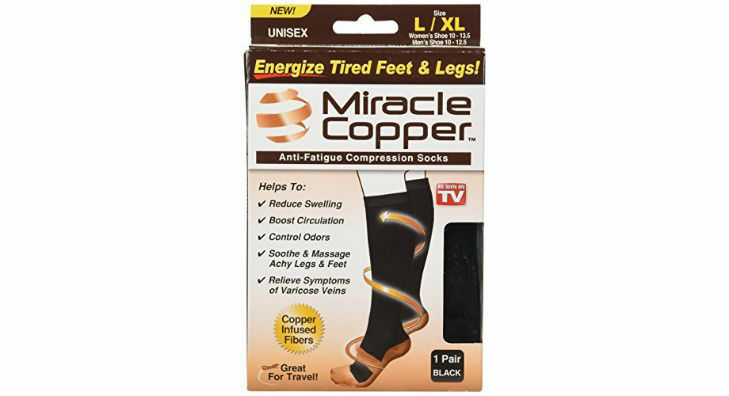 The Miracle copper compression sock is fairly priced; they’re certainly not cheap, but will not break the bank either. They are roughly the same price as the other similar products currently on the market and in other copper socks reviews, yet a highly regarded product at the same time. I won’t mention the exact price as it does vary based on the store. The cool thing about the Miracle socks is that they actually work. I was pretty skeptical when I saw their ads, especially as they are “as seen on TV brand”. For someone that isn’t aware of the healing properties of copper, the claims from Miracle do sound peculiar. That’s why it is so great that these ACTUALLY work. Standard compression socks do aid blood flow, but not quite as much as these copper infused socks do. This makes them perfect for people suffering from swollen and achy ankles. These socks are by no means perfect and do come with some negatives. A compression rate of 8-15mmHG is pretty darn low. While this makes them easy to get on and off, it means that the compression is quite mild. I would prefer a compression of 15-20mm HG. The socks do also have a tendency to slightly shrink on the first time of washing. Although the shrinkage amount is small, it is still quite frustrating. There are of course alternative copper based compression socks on the market. It would be rude of me not to mention any of these in this copper socks review. The CopperJoint Compression socks have a compression rate of 15-20mmHg; this is higher than the Miracle version and is a sock I would recommend if you require a tighter fit. The CopperJoint socks are made of a super soft material and are very easy to get on. The only negative is that the top of the sock is prone is sliding down. They are available on Amazon.com here. Another product worth a mention is the J-Trendy Compression sock (view on Amazon.com). This is another product with a compression of 15-20mmHG. This product appears very similar to the Miracle, the main difference being the compression amount. Oh and I almost forgot the amazing fact that you get 6 pairs of the J-Trendy brand, for roughly the same cost as the Miracle! To conclude the Miracle socks review I have to say that I think overall this is a solid product. The socks get a lot of hype and to be fair I believe that it is deserved. The socks are also a fair price. On a personal note, I do wish that the socks had slightly more compression. However, many will prefer the lower compression; this also means they are easier to get on/off. I would especially recommend this product for pregnant women who are suffering from swollen feet. With that said, I do prefer the J-Trendy version. You can check these socks on Amazon.com here. The product has more compression and you get 6 pairs, this will last a very long time and means that you will always have a spare pair should you require.